Louis de Freycinet : Canoes of Tasmania , 1802. Imprimerie Royale, Paris, 1815, 2 volumes. 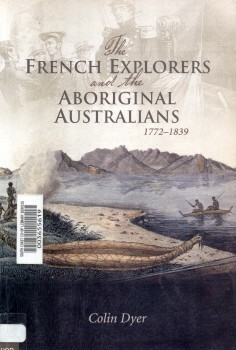 Dyer, Colin: The French Explorers and the Aboriginal Australians 1772-1839. University of Queensland Press, St. Lucia, Queensland, 2005 . In a state so cut off from civilisation, their arts have not been able to perfect them­selves very much. Although the inhabitants' country has infinite inlets, their canoes are still of an extremely defective construction. We have seen and measured many of them which all had the same dimensions and were built in exactly the same way. We have seen many who believe and measure the same dimension, deriving their an absolutely similar way. Three rolls of eucalyptus bark in composed whole framework. These vessels, that everyone has taken apart, resembled the yardarm of a vessel and were bound at their ends, which meet at a tip resembling that of a canoe. They were solidly assembled from a type of a grass or reed. Five or six savages can man these canoes; but more commonly they hold only three or four at-a-time. Their paddles are simple pieces of wood from 2.5 m [ 7 ft 8"] up to 4 or 5 meters long [11 ft 6" or 15 ft 5"], with the thickness varying from 2 to 5 centimeters [d]. They usually sit to manoeuvre their boats, using bundles of hay as seats. At other times they stand. We have only seen them cross the channel in fine weather: such frail and makeshift vessels could neither advance nor even stay up in a rough sea. Campfire and rolled-bark or reed fishing canoes, Tasmania, 1803. - Museum d'Historie naturelle, Le Harve. - Burnum: Burnum Burnum (1988) page 267. (We never been scope to examine the manner in which is their sins;? but as an example of their industry in this respect, I borrow the details here? ); the women advances and then dives among the rocks into the sea, and the they will venturer to the bottom of the waters to find crustaceans and shellfish. As ladies were long time, we were concerned about their fate because they had dove in the middle of a great length marine plants. We worried that they will be found entangled, and that they might not return to the surface. Finally they reappeared, and we noted that their stay underwater two times longer than our most skilled divers. A moment sufficed them to breathe; then they dove again until their task was completed. Most were equipped with a small piece of spatula-shaped wood; which served to detach them from the cracks in the rocks at great depth under water, and returned with very large abalone and lobsters. At the sight of these large lobsters that fill their baskets, we were afraid that these crustaceans may harm these unfortunate women with their huge claws; but we were not long in seeing us they had the precaution of killing them when caught. They return from the water to give their husbands the fruits of their work, and often they were returning to dive almost immediately, until they had made a rather abundant supply to feed their families. At other times, they relaxed facing the fire and grilling the catch, with other small fires to warm up in every direction. It seemed they regretted staying only a moment; because while reheating, they were still busy grilling the shells they moved on the coals with great caution; but they gave much less care for lobsters they prepared. University of Queensland Press, St. Lucia, Queensland, 2005. Chapter 3. Descriptions of the Aboriginal Australians. The native people also carried fire in their canoes. In New South Wales Louis de Freycinet remarked in 1802 how ''they always maintain a fire in the middle of the canoe [pirogue]: they place it on a bed of earth or ashes, and use it to cook the fish they catch''. Some form of water transport seems to have been found on much of the continent, with the notable exception of the south and west coasts. Peron noticed the total lack of inhabitants on all the islands off the shores, from indeed the detroit de Bass to the terre de Nuyts (west of today's Albany). The ''main cause'' for this, he thought, ''was their abso­lute ignorance of navigation''. especially so in Tasmania where the expeditions of D'Entrecasteaux and Baudin encountered many of these small craft. Near Adventure Bay in May 1792, St Aignan reported finding "a kind of canoe, flat both above and below, about seven to nine feet long, in the middle three or four feet wide and finishing in a point at the two ends. It was made of large pieces of bark joined together in bands running lengthwise, and fastened with rushes or strands of grass." Baudin's encounters were even more extensive, and he himself saw indigenous people "crossing from the [Tasmanian] mainland to D'Entrecasteaux [i.e. Bruny] Island in canoes". His companion, Cap­tain Hamelin, also met two people "in one of their miserable canoes" making the same crossing and, on one occasion, he actually brought in one of these craft so it could be examined more closely. "I think the term 'raft' or 'floating buoy' would be more appropriate than 'canoe','' he declared. As the descriptions of these canoes rather resemble one another, Louis de Freycinet's detailed presentation of those studied in the D'Entrecasteaux Channel may suffice here. "In a state so cut off from civilisation," he wrote, "their arts have not been able to perfect them­selves very much" and consequently their "canoes [pirogues] are still of an extremely defective construction [d'une construction extremement defectueuse]: We have seen and measured many of them which all had the same dimensions and were built in exactly the same way". "Three rolls of eucalyptus bark made up the general framework [charpente]. The main piece was 4 m 55 long and one metre wide; the two others 3 m 9 long and 0 m 32 thick. The savages [sauvages] can number five or six in these pirogues, but more usually they only go three or four at a time. Their paddles [pagaies] are simple pieces of wood, from 2 m 50 (7 ft 8") up to 4 and even 5 metres long (11 ft 6" and 15 ft 5"), and a thickness going from 2 to 5 cm. They usually sit to manoeuvre their pirogues, when they use bales of hay [bottes de foin] as seats. We have only seen them cross the channel in fine weather: such frail and makeshift embarkations could neither advance nor even stay up in a rough sea. In New South Wales too Freycinet observed similar craft which could also ''not navigate at all off the coasts, but only in the bays, harbours and rivers''. In 1770 Joseph Banks had also counted a max­imum of three persons in these canoes at Botany Bay. Further north still, in Raffles Bay some sixty years later (in 1839), Lieutenant Barlatier Demas, in L'Astrolabe with Dumont d'Urville, ''saw two canoes coming out to the ship carrying eight or ten savages''. Chapter 3. Relations between the Aboriginal Australians and themselves. Perhaps the most painful of these tasks was the procurement of food for the family, and among these the need to collect lobsters and shellfish by plunging for long periods into the cold seas of southern Tasmania. Several of D'Entrecasteaux's people (including D'Entrecasteaux himself, Labillardiere, Ventenat and La Motte du Portail) give detailed accounts of this activity, all of which resemble one other, and confirm the Frenchmen's concern for the women involved and their surprise at the apparent laziness of the men. La Motte du Portail's account will suffice here. "Lunch time was approaching, and we were curious to see them make their meal. their fishing gear from the bush where they had hidden it. This consisted in a basket made out of reeds ... of which the strings were arranged in such a way that the head and left hand could be passed. In addition to the basket there was a piece of wood whose shape was like our toilet knife [sic], and which was carried between the teeth. So arrayed, they would go to the sea and dive several times and eventually fill up their basket with crayfish, abalones and oysters that they would remove from the bottom with their little piece of wood." Elsewhere La Motte du Portail, along with colleagues Labillardiere and Ventenat, also noted that the women brought up several lobsters. La Motte du Portail continued: "Chilled to the bone [and this in mid-summer! ], they would come out of the water and then each would light a fire, around which the family would gather, and she would cook the catch ... Soon afterwards, a distribution was made: first the children, and then the husband who had been waiting for this moment with the greatest patience without, however, having made the slightest move to help ... A second fishing followed this meal. The French were ''amazed at seeing how women were reduced to so tiring a task'', and tried to discover why. One of the native men ''made us clearly understand', wrote La Motte du Portail, 'that the work we had seen the women do, would be fatal for him and his companions''. Trustees of the Public Library of New South Wales in association with Angus and Robertson, Sydney, 1962, vol. 2, page 134. Imprimerie Royale, Paris, 1815, vol. 2, pages 293 and 45. 217. Bougainville, Hyacinthe de, Journal de la navigation autour du globe, Paris, 1837, vol. 1, page 485. 218. Lesson, Rene Primavere, Voyage autour du monde sur la corvette 'Ia Coquille', Paris, 1838, vol. 2, page 289. 219. Peron, Francois and Freycinet, Louis, Voyage de decouvertes aux terres australes. Historique, Paris, 1807 and 1816, vol. 2, page 122.
translated by E. and M. Duyker, Melbourne Uni­versity Press, Melbourne, 2001, page 125. 221. Plomley, N.J. B., The General, Queen Victoria Museum, Launceston, 1993, pages 133 and 121. Libraries Board of South Australia, Adelaide, 1974, pages 304,312 and 334. Imprimerie Royale, Paris, 1815, vol 2 page 61. Imprimerie Royale, Paris, 1815, vol 2 pages 44-5. Imprimerie Royale, Paris, 1815, vol 2 page 293. Trustees of the Public Library of New South Wales in association with Angus and Robertson, Sydney, 1962, vol. 2, p. 134. Melbourne University Press,Melbourne, 1987, vol. 2, page 413. The General : the visits of the expedition led by Bruny d'Entrecasteaux to Tasmanian waters in 1792 and 1793. Queen Victoria Museum, Launceston, Tasmania, 1993, pages 341-342. 17. Lappace, Cyrille Pierre Théodore: Voyage autour du Monde par les Mers de l´Inde et de Chine exécuté sur la Corvette de l´etát La Favorite pendant les années 1830, 1831 et 1832. Imprimerie Royal, Paris, 1833-35, volume 3, page 262. Laplace set sail for Hobart, and sighted Mewstone on 6 July. Two more men were buried on Bruny Island, before La Favorite was allowed to anchor at Hobart on 11 July. The sick men were sent to hospital, although three men were to die there. Laplace left Hobart on 7 August, and set sail for Sydney, arriving on 16 August. In Sydney the crew went to numerous social events, left to a twenty-one gun salute on 21 September 1831. Arago, Jacques, Narrative of a Voyage Round the World, London, 1823,2 vols. Arago, Jacques, Souvenirs d'un aveugle: Voyage autour du monde, Hortet et Ozanne, Paris, 1839, 4 vols. tralians: A Historical Atlas, Fairfax, Syme and Weldon Associates, Sydney, 1987. Banks, Joseph, The EndeavourJournal of Joseph Banks, 1768-1771, ed.J. C. Beaglehole, Trustees of the Public Library of New South Wales in association with Angus and Robertson, Sydney, 1962,2 vols. -allier, Francisjowrad/ of the Expedition into the Interior of New South Wales, 1802, Marsh Walsh Publishing, Melbourne, 1975. e, C. H., 150 Years of Sydney, Shakespeare Head Press, Sydney, 1933.
nnemainsjacqueline, Baudin in Australian Waters. The Artwork of the French Voyage of Discovery to the Southern Lands, 1800-1804, Oxford University Press, Australia, 1988.
nnemains, Jacqueline, Mon Voyage aux terres australes, journal per­sonnel du commandant Baudin, Imprimerie Nationale, 2001. gainville, Hyacinthe de, Journal de la navigation autour du globe, Paris, 1837,2 vols. 1791-1793, translated by E. and M. Duyker, Melbourne Uni­versity Press, Melbourne, 2001. Clendinnen, Inga, True Stories, ABC Books, Sydney, 1993. Collins, David, An Account of the Colony of New South Wales, London, 1798. Flinders, Matthew, A Voyage to Terra Australis ... in the Years 1801, 1802 and 1803, London, 1814. Freycinet, Louis de, Reflections on New South Wales, 1788-1839, Hordern Press, Potts Point, NSW, 2001. This is a translation by Thomas Cullity of Chapters XXIX to XL, 'Historique', vol. 2, parts 2 and 3, of Freycinet's Voyage autour du monde ... pendant les annees 1817-1820, Paris, 1839. Freycinet, Louis de, Voyage autour du monde ... Historique,vol. 2, part 2, Paris, 1939. Freycinet, Louis, Voyage de decouvertes aux terres australes. Navigation et Geographie, Imprimerie Royale, Paris, 1815. Heeres, J. E., The Part Borne by the Dutch in the Discovery of Australia,1606-1765, London, 1899. London, 1800,2 vols. La PerouseJ. F. G. de,^l Voyage Round the World in the Years 1785-8, cel. Mortimer, G., Observations and Remarks Made during a Voyage ... Com­manded by John Henry Cox, Esq., London, 1791. Kenny, John, Before the First Fleet. Europeans in Australia, 1606-1777, Kangaroo Press, Sydney, 1995. Kennyjohn, Bennelong, First Notable Aborigim\ Royal Australian His­torical Society, Sydney, 1973. Labillardiere, Jacques de, Voyage in Search 0jU Perouse, Stockdale, London, 1800, 2 vols. La PerouseJ.FG.de,.4 Voyage Round the World in the Years 1785-8, ed. Masefieldjohn, Dampier's Voyages, London, 1906,2 vols. McPherson,Kaye (Tereetee Lore), Risdon Qmftom the Dreamtime to Now. The Centenary of Federation, 2001, Manuta Tunapee Puggaluggalia Publishers, Lindisfarne,Tasmania, 2001. Memoirs of Madame la Marquise de Montespant London, 1895, 2 vols. Micco, Helen, King Island and the Sealing Traie Roebuck Books, Fysh-wick,ACT, 1971. Milius, Pierre Bernard, Recit d'un voyage aux tares australes, Societe Havraise d'Etudes Diverses, 1987. Mitchell, Major Sir Thomas, Three Expedition to the Interior of Eastern Australia, London, 1839, 2 vols. Mortimer, G., Observationsand Remarks Madt faring a Voyage ... Com­manded by John Henry Cox, Esq., London 1791. Peron, Francois and Freycinet, Louis, Voyage de decouvertes aux terres australes. Historique, 2 vols, Paris, 1807 and 1816. Peron, Francois and Freycinet, Louis, Voyage de decouvertes ... Atlas (Historique) par MM. Lesueur et Petit, Paris, 1807. London, 1809. Reprinted by Marsh Walsh Publishing, Mel­bourne, 1975. (Translation of vol. 1 of Voyage de ...). Plomley, N.J. B., The Baudin Expedition and the Tasmanian Aborigines, 1802, Blubber Head Press, Hobart, 1983. Plomley, N.J. B., The General, Queen Victoria Museum, Launceston, 1993. Plomley, N.J. B. The Tasmanian Tribes and Cicatrices Queen Vic­toria Museum, Hobart, 1992. Reynolds, Henry, The Other Side of the Frontier, History Department, James Cook University, Townsville, 1981. Richard, Helene, Le Voyage de D'Entrecasteaux a la recherche de Laperouse, Paris, 1986. Riviere, Marc Serge, A Woman of Courage. Rose de Freycinet's Diary, 1811-20, National Library of Australia, Canberra, 1996. Riviere, Marc Serge, The Governor's Noble Guest, Melbourne Univer­sity Press, Melbourne, 1999. Rosenman, Helen, Two Voyages to the South Seas by Jules S-C. Dumont d'Urville,Me\bourne University Press,Melbourne, 1987,2 vols. Rousseaujean-Jacques, jEmi'/e/br 7o<idy, Heinemann, London, 1956. Rousseau, Jean-Jacques, Lettre a M. D'Alembert, Flammarion, Paris, 1967. Rossel, Paul de, Voyage de Dentrecasteaux a la recherche de Laperouse, Paris, 1808,2 vols. Ryan, Lyndall, The Aboriginal Tasmanians, Allen and Unwin, St Leo­nards, NSW, 1996. Scott, Ernest, The Life of Matthew Flinders, Angus and Robertson, Sydney, 1914. Stocking, G., 'French Anthropology in 1800', in Isis, 1964, vol. 35,2, no. 180. Tench, Captain W., A Complete Account of the Settlement at Port Jackson, London, 1793. Geoff Cater (2014) : Louis de Freycinet : Canoes of Tasmania, 1802.